Castor oil contains a compound that gives it amazing abilities: ricinoleic acid. This fatty acid is rarely found in other plants and contains a host of benefits that make it perfect for use on the skin. – Soothe Inflammation: Ricinoleic acid contains anti-inflammatory properties. Access them by applying castor bean oil topically. Dip a cotton ball into organic castor oil, then apply the oil directly to your skin. Let it sink in for an hour, then wash it off. – Fight Aging: Castor oil helps your skin produce more collagen and elastin. Regular topical use can help delay the onset of wrinkles and keep your skin looking smooth, young, and radiant. You can also use castor oil to reduce fine lines around the eyes. – Treat Acne: Ricinoleic acid is also an effective anti-bacterial, which makes it a natural way to fight acne. Wash your face with warm water, then massage a small amount of castor oil into your skin. Let it sink in overnight. 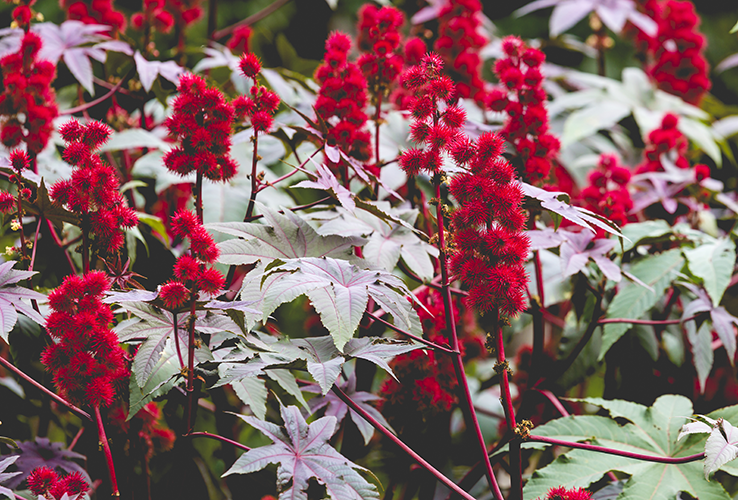 Because organic castor bean oil has a very low comedogenic rating, it’s unlikely to clog your pores. Castor oil is a natural solution to many common hair problems as well. – Hair Growth: Not only does castor oil help boost blood circulation to hair follicles (which helps promote faster growth), it contains omega-9 fatty acids, which help keep hair healthy and strong. Massage a small amount of castor oil into your scalp and damp hair. Put a shower cap or towel over your hair to keep the oil from getting on your furniture, then allow it to set in for a few hours (or even overnight). Shampoo as usual to wash out any remaining oil. – Reduce Dandruff: Dandruff getting you down? Ricinoleic acid to the rescue! Its anti-bacterial properties can help fight the bacteria that may be causing your scalp to flake. Apply a small amount of oil to your scalp 30 minutes before you wash your hair, or leave it in overnight for maximum results. Applying castor oil topically and ingesting it orally can both provide numerous health benefits. While research is still ongoing, topical castor oil application is associated with a healthier lymphatic system, which in turn leads to better overall health. Topical application can also help to reduce the inflammation that causes arthritic joint pain. Castor oil is an effective laxative when consumed orally, but should not be consumed if you are pregnant or nursing. I’ve only listed a few of the benefits of castor oil; there’s plenty more to love about this amazing ingredient. If you’ve never tried it before, try whipping up this DIY feet softening butter. I guarantee it will convert you! I use certified organic ingredients when I make this butter. Melt the first 2 ingredients over a double boiler. Then remove the pan from heat and add Lavender Essential Oil. Stir gently. Immediately pour the mixture into an uncovered jar. Allow your new creation to cool and set several hours, and then cover the jar. Just before climbing into bed, rub about a teaspoon of butter into the palms of your hands. Inhale the lavender fragrance (which is a well-accepted natural sleep fragrance). Then apply the butter liberally to both feet and cover with moisturizer socks (or you may use a pair old socks). Use my feet softening butter nightly for silky soft feet. Give this recipe a try, then let me know how it went in the comments below!